The holidays are a time of great cheer, but also of many, many social engagements. From office holiday parties to cozy family get-togethers to the all-out New Year’s Eve bash – there are a lot of questions about how one should dress this time of year. To make a stressful time easier, we’ve put together a handful of suggestions for what you may want to wear when it’s time to drink eggnog – with each section accompanied by some examples we like from our readers (remember to tag your Instagram fits with #PTOman so we can find you). Granted, we’ve always been big believers of understanding clothes as social language, so how you’ll want to dress will depend on your specific context. That said, if you need some ideas on where to start, here are a few. 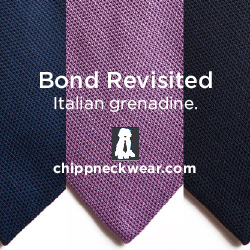 Office attire can run the gamut from t-shirts to pinstripe suits these days. 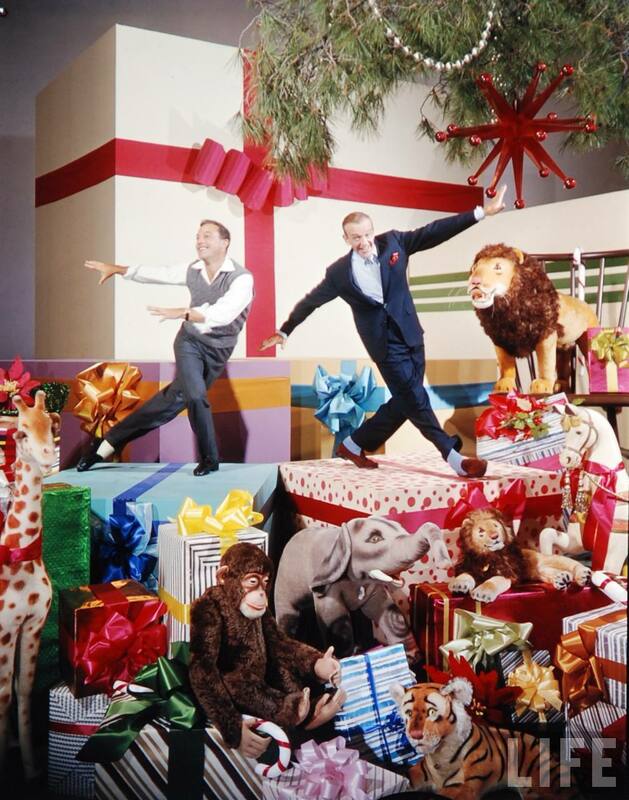 If you’re going to an office holiday party, we suggest knocking things down a notch or two from the usual level of workweek formality. It’s a party, after all. 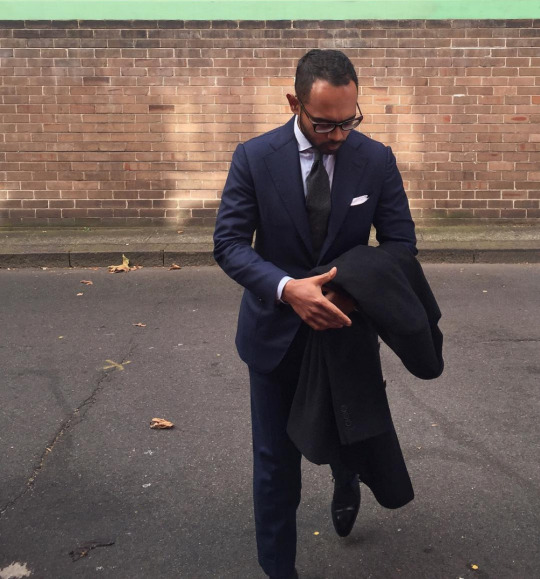 If you work in an office where everyone wears suits, consider taking things down to a sport coat with wool trousers. Have a knit or wool tie on hand if you think it might be required. If it isn’t, then just stuff it in the facing pocket of your jacket and be on your way with a breezier neck. 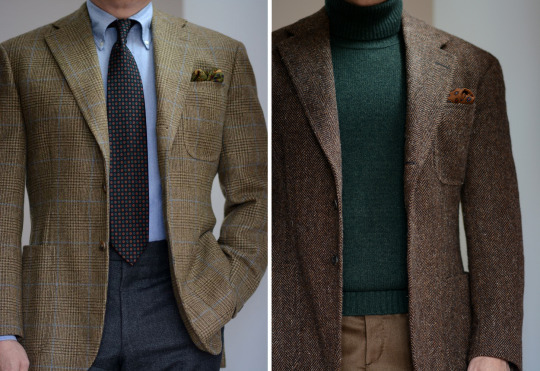 For extra style points – or to avoid the tie issue altogether – consider layering a wool turtleneck under the jacket (see Voxsartoria above for some nice examples). 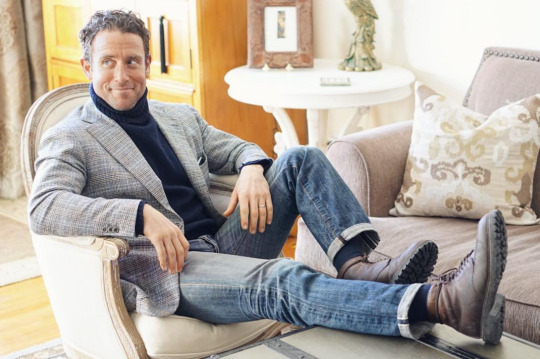 If your office is more informal, consider switching the grey flannel trousers out for some slim jeans or five-pocket cords, then layer a textured sweater over a button-down shirt. You can then add on some good, casual outerwear. Something like a wool duffle coat or suede leather jacket will look relatively dressier than a parka (Max above is wearing a nice one from Stoffa). 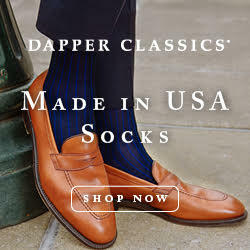 Similarly, wear shoes that straddle the line between casual and formal (what Jesse calls “in-betweens”). Pebble grained or suede chukkas, for example, will look better than your ratty gym sneakers. The holidays are a time of year when people feel inclined to splurge, whether on family, coworkers, or even themselves, so likely you’ll end up at a place with white cloth napkins at some point. And while few fine dining establishments require a coat-and-tie these days (there are maybe three or four in NYC), you probably won’t look out of place if you wear one. Depending on the restaurant, that could mean a dark suit with a white, broadcloth shirt, dark tie, and some polished, oxford shoes. If you have the choice, we think plain toe oxfords work better at night than cap toes. They look a little smarter and sleeker, which makes them a little better suited for fancy night occasions. Nabil has this down pat. 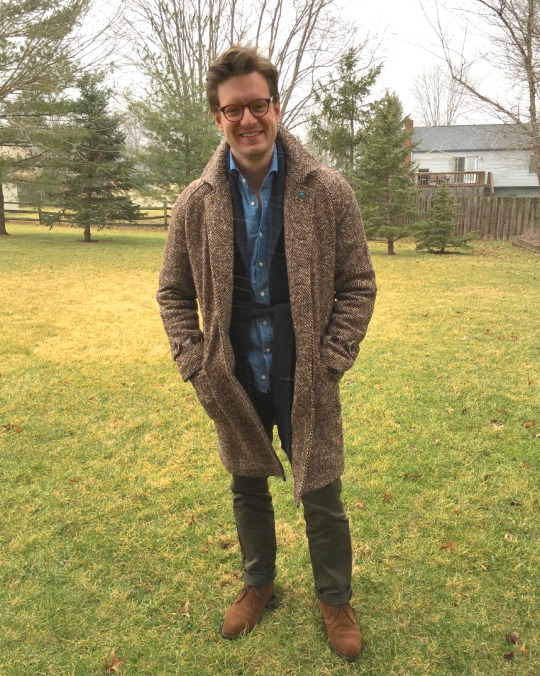 If the restaurant is more casual, you can’t go wrong with the tried-and-true sport coat with wool trousers ensemble (like Tim here) Go tieless, if you want, but wear a tailored jacket. Ties look goofy with dress shirts alone, and it’s hard to look well-dressed if you’re only in a button-up shirt and slacks. 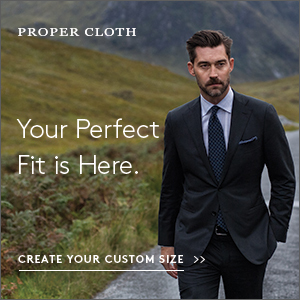 If you need to dress down the tailored jacket, check out our guides on how to read formality in tailored clothing, how to choose a more casual shirt (with fall/ winter specific options here), and how to wear sport coats with jeans. There are lots of ways of looking sharp without seeming overdressed. Again, a navy sport coat with grey trousers is a great place to start, but consider going a little more casual. Instead of a solid-colored sport coat, try a subtly patterned tweed with a softer shoulder line. I particularly like Donegal tweeds for these sorts of outings. Ties will be too much here, but a pocket square is more than appropriate. 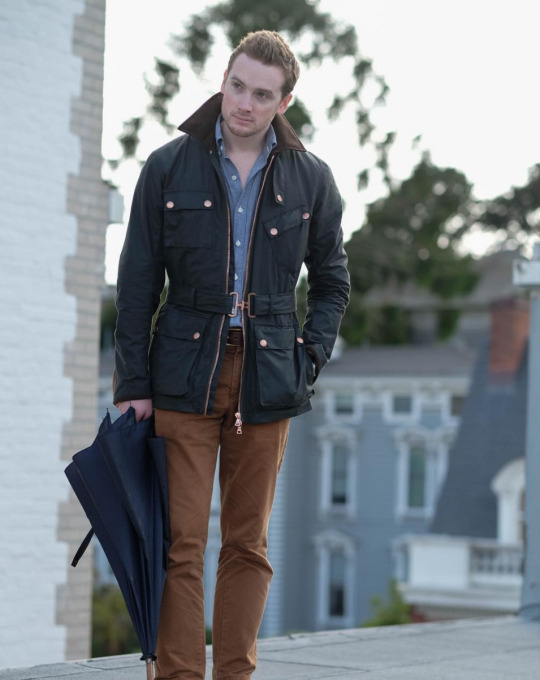 Consider wearing the jacket with Chelsea boots (or Dainite soled chukkas if the weather is nasty). If there was ever a chance this season to give sport coats with denim a whirl, this is it, like Pete is doing above. 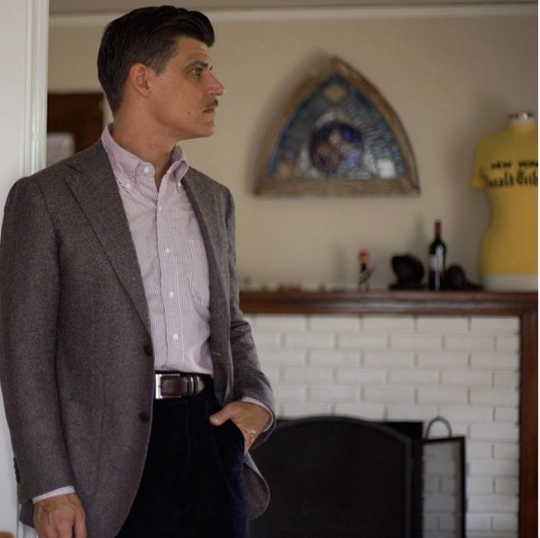 If a sport coat feels too formal, dress up a pair casual pants and a nice sweater with a tailored dress coat. 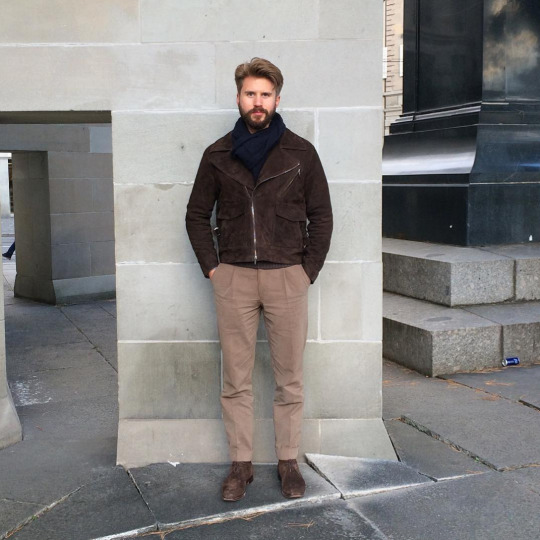 Something like a brown or navy topcoat can be a good way to play with levels of formality – dressing up what would have otherwise been a very casual ensemble without seeming too fussy (see Mitchell here, who’s paired something from Eidos with a belted shawl collar cardigan). You can also spruce things up with a pair of nice leather gloves or a patterned cashmere scarf. Before the journeys home, you’ll probably encounter a couple of get-togethers with your regular ole rest-of-the-year friends. A friend of mine loves to have tree-decorating parties with ginger cookies and winter beers. 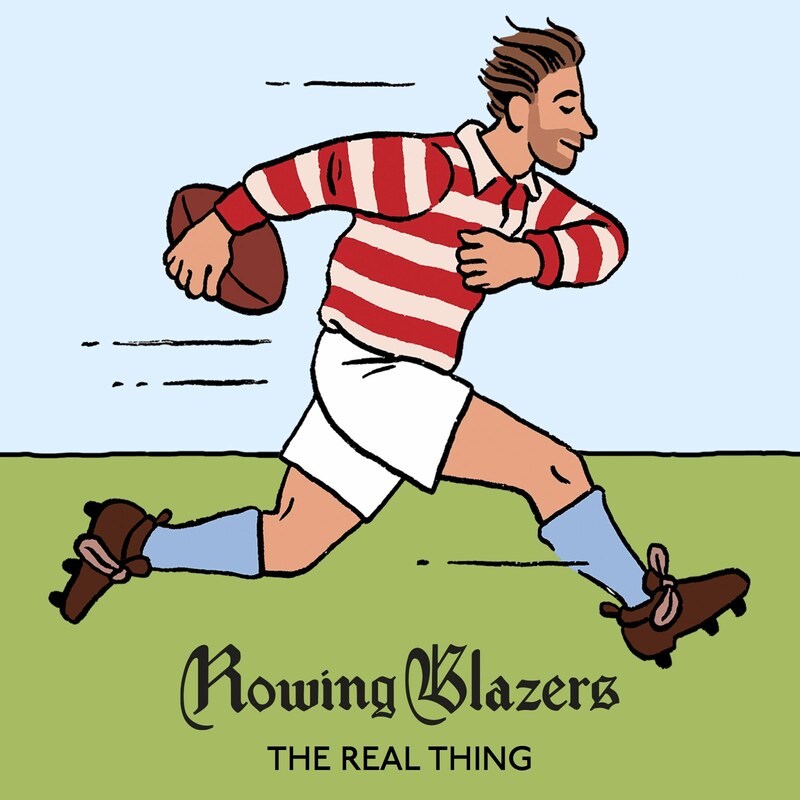 It admittedly sounds pretty grandpa of him, but damn it – the season is infectious. Don’t stress these occasions that much. They should be fun and familiar, so your everyday attire will be fine, but do remember someone is inviting you into their home, so be a courteous guest in your dressing manner. Chunky sweaters are fantastic here because they feel both appropriate in terms of the season, but also are great to throw over an otherwise very casual outfit to bring a bit more direction and purpose. Something like a cabled Aran or Shetland will again look more interesting than a smoother merino. For something that feels festive, but not campy, try a Fair Isle or Nordic sweater. Pete has some great suggestions for holiday knitwear here. We also like the kind of outfits shown above – our own Pete in some workwear and denim (a leather jacket here would also work well); Gerry in a casual sport coat and band-collar shirt (a nice way to play with details); and Ben sporting a plaid shirt and heavily textured cardigan (the knit, from SNS Herning, is a nice way to add visual interest). Should you be in a serious relationship, you may find yourself spending the holidays far from your home turf and with your significant other’s family. These can, of course, be stressful times, even if it isn’t the first time you’re meeting the folks. Standing on ceremony will seem affected, but you should also keep a good face on, as being in someone else’s home for the holidays is intimate and privileged. The best sort of outfit is the kind suited for joining the in-laws on a leisurely, get-to-know-you stroll. Keep it simple with denim or chinos, as well as boots that are best suited for the environment you’ll be trekking through. 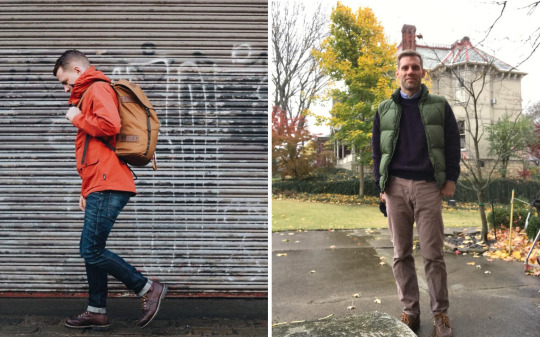 If you’ve been getting in and out of suits and sport coats for all other occasions, you can take a break today and go with a winter-weight shirt jacket, such as chamois, and throw a puffer vest or parka over it (see Arran and Jerrod above). 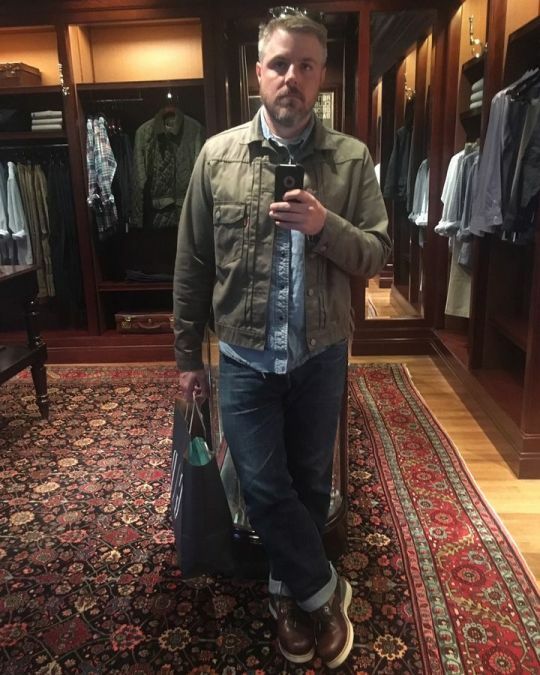 Waxed cotton jackets, such as the one Ian is wearing here, also work well over denim or chambray shirts. And don’t forget a sweater for the dog, who is of course coming with you on this walk. Opening presents seems like a silly thing to make special note of. After all, it’s just for you and the immediate family on that magical Christmas morning, so it shouldn’t be the source of sartorially worry. You’ve made it through another year and you should enjoy your day off. That said, if you need suggestions, we like the idea of casual pants (e.g. 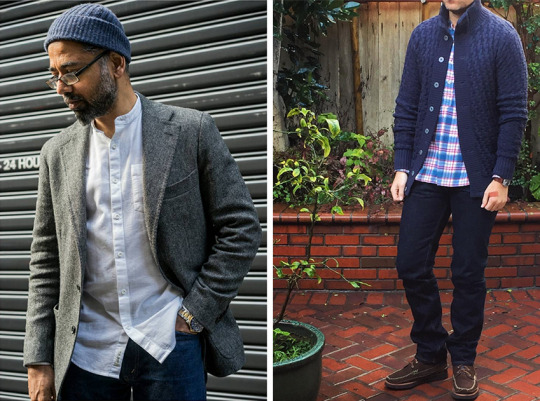 chinos, five-pocket cords, or jeans) with a chunky shawl collar cardigan, tartan sweater, and some slip-on shoes. See our friend Gerry above for inspiration. 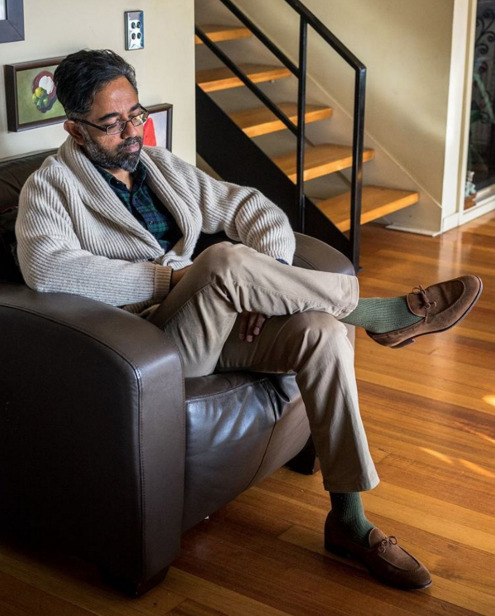 The shawl collar cardigan works well in lieu of a jacket, as the lapels help frame the face (especially when they’re on the thicker side of things). 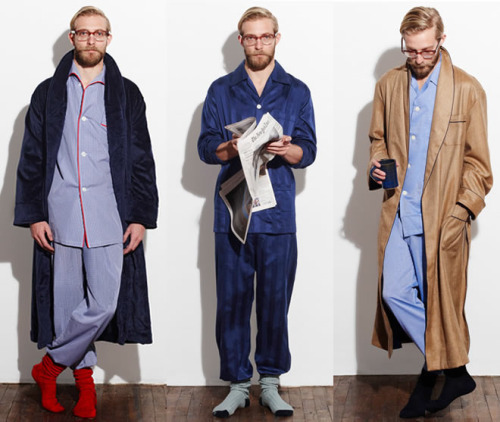 For something more laid back, you can’t get more comfortable than wearing a pair of brushed cotton pajamas. If you don’t own a dressing gown, a cotton robe will make fine a substitution (OK, the photo above is the only one that isn’t of a PTO reader, but nobody would send us photos of themselves in PJs). 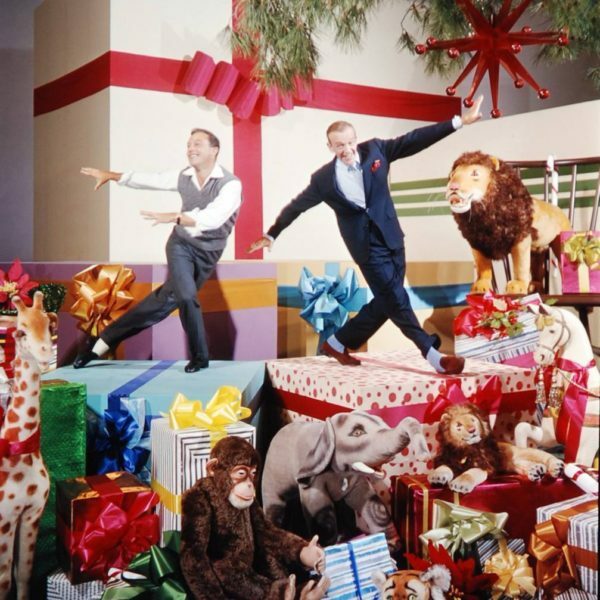 Plus, should junior open that gift that was underlined a dozen times on the wish list and the cameras come out to record that joyous reaction, you’ll be doing yourself a favor by looking good enough to, you know, be photographed. Don’t forget house slippers to avoid any unfortunate missteps on newly opened Legos. No matter who you are, New Year’s Eve is the great equalizer when it comes to eveningwear. No weddings or galas needed – the black tie can come out of storage. The photo above is of Andy from San Jose last year who put together a black tie ensemble that looks wholly natural on him. Granted, this would like a little silly if you were going to a pub with shot and beer specials, but NYE is a great opportunity to break out an infrequently used tuxedo. 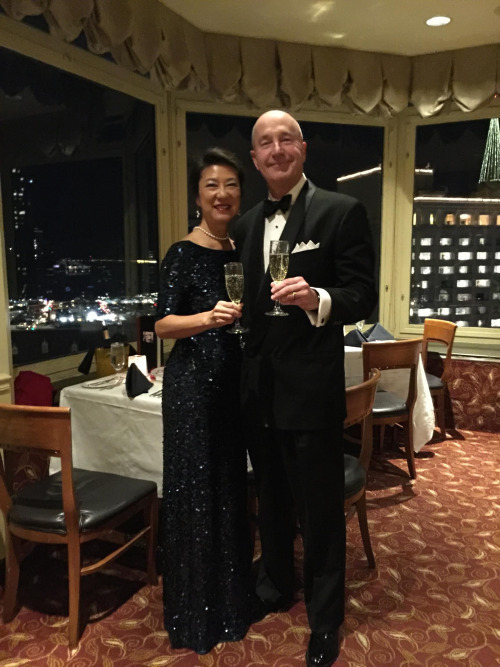 Use NYE as an excuse to wear special clothes, and special clothes as an excuse to do special things (Andy and his wife wear their formalwear on NYE to nice restaurants). We have a guide on how to wear black tie here, as well as two guides on how to do it on a budget. If you truly don’t feel inclined to do black tie, then at least dress appropriately for a holiday that demands champagne. You can consult the Fancy Meals at Fancy Places section above, or do what Derek calls “black tie alternative.” Those should keep you covered through to 2017.